Climate change and economic development are causing increased pressure on water, energy and food resources, presenting communities with increased levels of tradeoffs and potential conflicts among these resources. Therefore, the water-energy-food nexus is one of the most important and fundamental global environmental issues facing the world. As water is the central matter within this cluster, we will focus on the inherent tradeoffs between water and food, and water and energy. For the purposes of this project, we define human-environmental security as the joint optimization between human and environmental security as well as the water-energy and water-food connections. 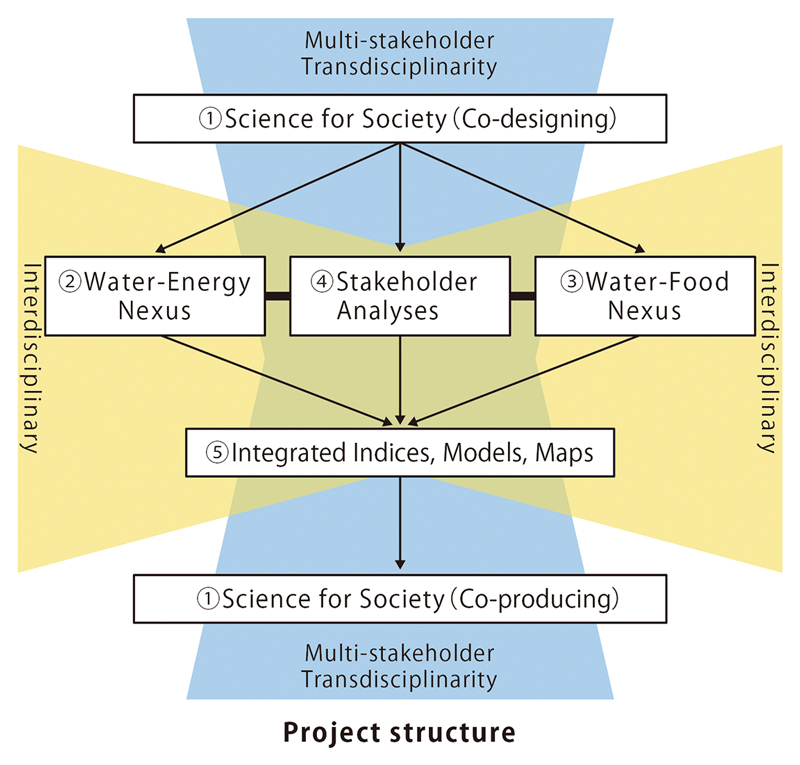 To optimize the governance and management within these inter-connected needs, it is desirable to increase human-environmental security by improving social management for the water-energy-food nexus. 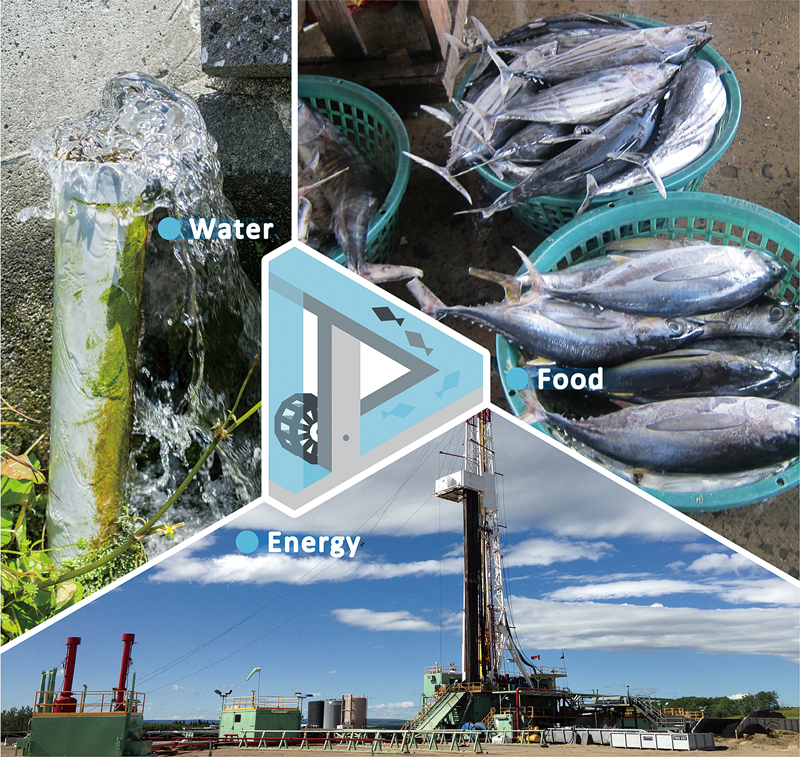 In this research project, we intend to establish a method to manage and optimize the human-environmental security of the water-energy-food nexus. 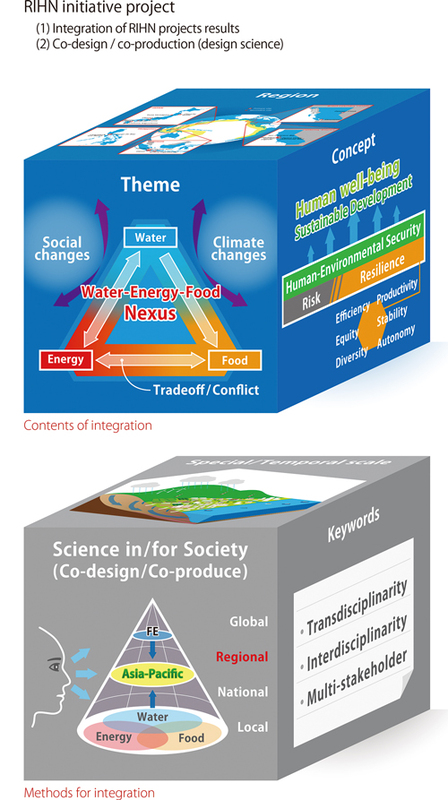 We base our approach on the viewpoint that it is important for a sustainable society to increase human-environmental security and decrease vulnerability by optimizing the connections within the critical water-energy and water-food clusters. We will take a regional perspective to address these global environmental problems. The geological and geomorphological conditions in our proposed study area are heavily influenced by the so-called “Ring of Fire,” around the Pacific Ocean. Within these areas including Japan and Southeast Asia, the hydro-meteorological conditions are dominated by the Asia monsoon. The populations that live under these natural conditions face elevated risk and potential disaster as negative impacts, while also benefitting from positive ecological goods and services. There are therefore tradeoffs and conflicts within the water-energy-food nexus, as well as among various stakeholders in the region. The objective of this project is to maximize human-environmental security (minimize vulnerability) by choosing management structures and policies that optimize both the water-food and water-energy connections in Asia-Pacific coastal regions. We define a joint security approach as optimized policy for both critical water clusters. Optimal policies will develop joint security approaches for human-environmental security in the coastal region of the Ring of Fire, including stakeholders and decision-makers. 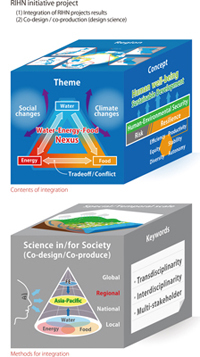 Five different interdisciplinary approaches, scales and clusters will be used in this investigation: (1) Environmental governance, science in/for society, and co-design/co-production approaches, in particular emphasizing integration of local-national scale stakeholders, and regional scale stakeholders such as GEC (Global Environmental Change) Asia/ Future Earth in Asia-Pacific Platform; (2) Biophysical measurements / analyses of the water-energy nexus by using state-of-art space satellite, geothermic, and hydrogeological techniques to evaluate linkages between water and energy; (3) Biophysical measurements/analyses within the water-food (e.g., fisheries resources) nexus by using state-of-the-art geochemical, coastal oceanographic, geophysical, hydrologic, and ecological techniques including isotopic tracers to evaluate the linkages between land and ocean; (4) Social measurements/analyses of water-energy-food relationships by use of stakeholder analyses, social network analyses, and community surveys, based on sociology, economics, anthropology, psychology, and behavior science methodologies; and (5) Development of integrated indicators/indices based on cost-benefit / efficiency analysis, environmental valuation, principal component analyses (PCA), and factors weights determined by feedback from stakeholder meeting/workshops, integrated physical models including water, nutrients for fishery resources, and temperature related to energy developments, integrated maps for the tools of policy option selections. At the regional scale of the water-energy-food nexus among 32 Asia-Pacific countries, we found that: the US mostly consumed energy for water transportation in comparison with other countries; and the ratio of utilization of water and energy consumption for fisheries activities in Japan, the Philippines and Indonesia were higher than that of other countries. 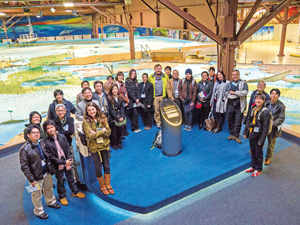 At the local scale of the water-energy nexus, the requisite amount of energy to raise the temperature of river water and the actual conditions of flows of hot spring water waste to rivers were obtained under the survey in Beppu, Japan. In addition the potential of geothermal energy was examined accurately by using an absolute gravimeter in Beppu and Kamojang Geothermal Field, Indonesia and the ground heat in Obama, Japan was also estimated. At the local scale of the water-food nexus, physical, chemical and biological surveys were conducted at four sites in Japan (Otsuchi, Obama, Beppu, and Yuza), two sites in Indonesia (Citarum river and Jakarta bay), and in the Philippines (Laguna de Bay) with different spatial scales (inter-bay scale and within-bay scale). 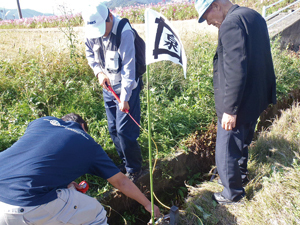 In Otsuchi, physical and biological surveys were conducted on submarine groundwater discharge (SGD) and collections of crustaceans / fishes. Biotic and abiotic data were compared between the two bays. Radon concentration, abundance and species diversity of fishes were higher in the bay with higher SGD. In Obama bay, physical and biological surveys were conducted, and higher fish abundance and species diversity were observed at the site with higher radon concentration. Suggested guidelines to increase environmental security and reduce conflicts related to the water-energy-food nexus. Recommendations for decreasing coastal vulnerability related to the separate governance of land and oceans. Policy and governance structure recommendations for improved water management. 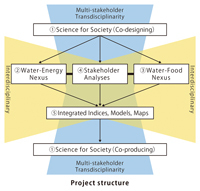 Suggestions for sustainable environmental management of the water-energy-food nexus in the Asia-Pacific region.